Shimano R065 SPD-SL Road Shoes is rated 4.4 out of 5 by 209. Rated 5 out of 5 by Jan777 from Lightweight and comfortable The best value for price. Good fitting and well ventilated. Needed to choose one size above your shoe number. Rated 5 out of 5 by Noyski from Great Value for Money Not the best option but these shoes work just fine. Rated 4 out of 5 by FatBlokeonThinTyres from Not applicable Returned as just too small for me. Ordered a different Shimano product instead. I bought these to go with https://www.wiggle.co.uk/shimano-pd-r540-spd-sl-sport-pedals/. Took me ten minutes to set up, nothing needed which was not in the box of either product apart from a v small alan key. How do these shoes compare to the dhb R1.0 Road shoes? Hi, I was looking for an entry level road shoe as I've just got my first road bike. I hope to do about 50k max per trip. I take an eu 46 or 47 in normal shoes &amp; have reasonably wide feet. Just wondering if anyone has any experience with any of these shoes? Any advice would be great. Thanks, John. I have just purchased a pair. I am size 11 (uk ) and went for the size 47. Very comfortable so far. I have only done rides less than 30km so far but all good. Could you please help me in selecting the correct size? 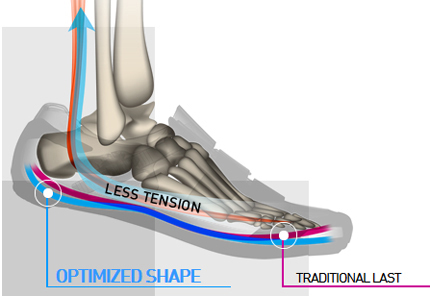 We find Shimano shoes offer a close fit against the toes of the user so we tend to advise going for the next size up than the standard size chart would suggest, and have modified the chart to show this. In this instance, an EU45 would be suitable without issue. Two or three holes for the cleats? These come with both types of cleat mounting holes, as per the image attached to this reply. I'd say so yes, there's nothing to say male or female only. Do these fit Shimano PD-R450 pedals? are these compatible with PD-A520 pedals? just curious if these would be compatible with PD-A520 pedals, and would i need to buy any cleats or would they come with the pedals or shoes? These shoes would work with the Shimano PD-A520 Touring Pedals as they both take an SPD cleat fitting. Cleats arer not included with the shoes but are included with the pedals. However, the following pedals may be better suited to work with these shoes. We would recommend a size 46. I would suggest sizing up in these.